Ignite Your Selling Potential walks you through 7 SIMPLE Accelerators to DRIVE REVENUE and RESULTS FAST. 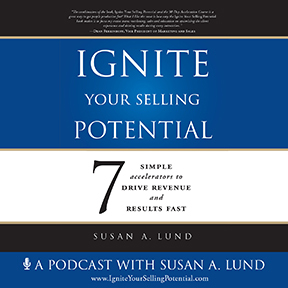 In Ignite Your Selling Potential, Author Susan A. Lund reveals a practical roadmap with 7 Accelerators™ to inspire, equip and empower you, your team and your organization to drive profitable revenue and results fast. You will gain access to proven strategies and principles that work to bring about the growth you desire and catapult your organization to greater success.